The Player device that creates an endless stream of musical ideas. 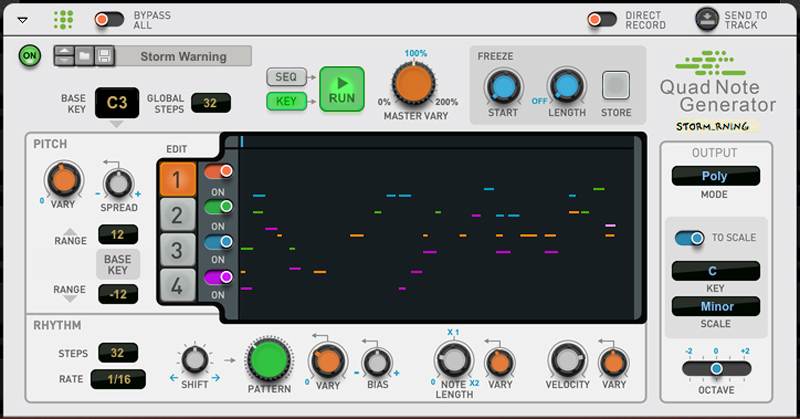 Create melodies, rhythms and harmonies you wouldn’t have thought of with Quad Note Generator. This new Player Device from Propellerhead Software will help create bass lines, leads lines or other musical phrases to fit your music, based on scale and your preferences for rhythm and variation. It can generate melodies on its own or respond to your keyboard playing. Working with Quad Note Generator is a bit like having a co-writer along that says “what if we try this” when you create music. With the freeze function, you can create phrases that are part repetitive and part improvisational in nature. What will Quad Note Generator add to your music? Quad Note Generator comes with a selection of patches to help you get going. Set the base key and length of your pattern. With the KEY option, Quad Note Generator will change base key with your keyboard playing. Otherwise it will play based on the base key. This knob scales the variation set in all other parameters from 0 (no variation) to 200% (think… free form jazz). Lets you freeze a section of a pattern that you want to have repeated, while the parts not in the freeze zone will keep changing. Here you control the pitch of your notes. Set vary amount and spread. These settings are separate for each of the four generators. Set individual length and resolution for each generator. Also select the euclidian rhythm pattern, rhythmic variation and settings for note length and velococity. Select your output mode based on what instrument you are controlling. Poly or several types of mono. Scale lets you pick a scale that Quad Note Generator will work within.